For the opening of the third wave of Agitprop!, renowned artist Charles Gaines presents two of his major works, with musical arrangement by Sean Griffin, composer and director of Opera Povera. 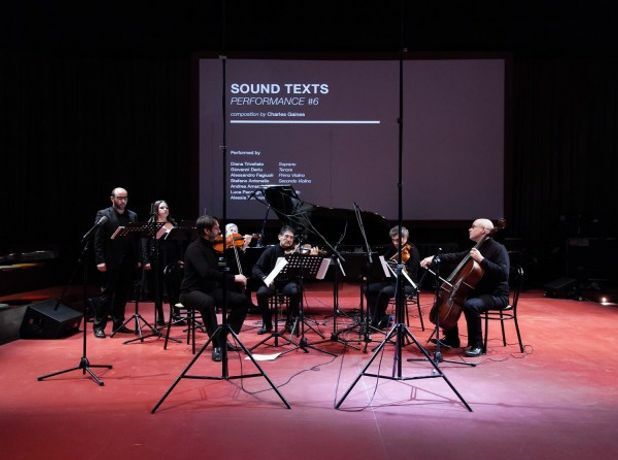 Sound Text (2015) and excerpts from Manifestos (2008) will be performed by an eight-piece ensemble with a large-scale video projection. In Manifestos, Gaines translates revolutionary declarations from a range of sources, including the Black Panther Party and the Zapatistas, into musical notations, which are performed by a string quartet, piano, and harp. Gaines uses a similar transcriptional system in Sound Text to translate political documents into harmonies. These arrangements are layered with melodies from historical songs ranging from Reconstruction Era spirituals to ballads from the French Revolution. Limited number of free tickets available at the Admissions Desk at 6 p.m. on the day of the event.